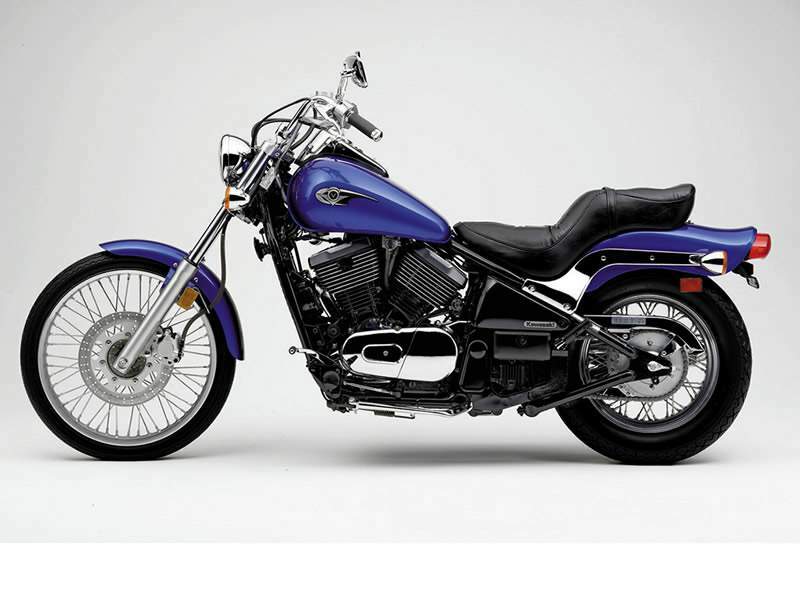 No genre in the motorcycle world provides such a wide variety of style and engine size choices as the cruiser segment, and one of the best is the Kawasaki Vulcan® 800. The heart of the Vulcan 800 is a powerful 805cc V-twin engine, which benefits from years of Kawasaki engineering expertise. The engine incorporates liquid cooling for exceptional temperature control and engine longevity, but its radiator is hidden between the downtubes of the double-cradle frame, giving the bike a stylish air-cooled look. The overall result is an attractive, high-torque motor that makes loads of power and emits the distinctive exhaust note associated with a V-twin. Like the engine, the Vulcan 800's chassis is the beneficiary of high-tech design and is clothed in nostalgic cruiser garb, including wire wheels, stepped seat and a teardrop fuel tank. Kawasaki's own UNI-TRAK® rear suspension system is hidden away to give the triangulated steel swingarm a clean, hardtail appearance. But in actuality, the linkage system applies progressive damping and spring forces as the single shock is compressed to provide a smooth ride. Power reaches the chain-driven rear wheel through a five-speed transmission. The transmission, which features Kawasaki's exclusive Positive Neutral Finder, allows the rider to easily shift from first gear to neutral when stopped. While stationary, the lever can't be raised into second gear, but as the motorcycle begins moving again the transmission resumes normal shifting. Fender to fender, this machine is the picture of fluidity. - Triangulated, steel swingarm looks like a "hard tail"